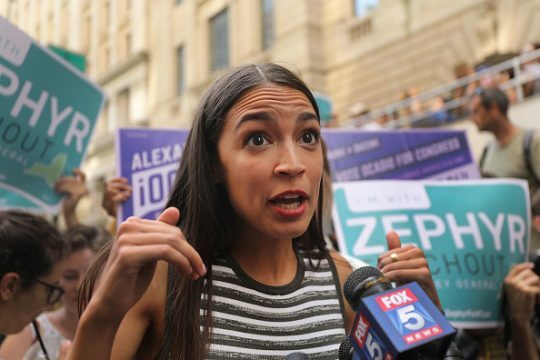 Alexandria Ocasio-Cortez likened conservative commentator Ben Shapiro's challenge to a public debate to "catcalling" in a tweet Thursday night, adding he had "bad intentions." Shapiro offered to give her congressional campaign—or a charity—$10,000 in exchange for an hour-long debate, noting Democratic National Committee chair Tom Perez said she represents the "future" of the party. A reporter for Shapiro's website The Daily Wire wrote an article about her refusal to respond to Shapiro's request, and Ocasio-Cortez screen-shotted his tweet, commenting that she didn't owe a response to something akin to "catcalling." "Just like catcalling, I don’t owe a response to unsolicited requests from men with bad intentions, " she tweeted. "And also like catcalling, for some reason they feel entitled to one." Shapiro swiftly responded, writing, "Discussion and debate are not "bad intentions." Slandering someone as a sexist catcaller without reason or evidence does demonstrate cowardice and bad intent, however." "But sure, go with "the Orthodox Jew who has never catcalled a woman in his life is ACKSHUALLY a sexist catcaller for asking for a discussion or debate." I’m sure your media sycophants will eat it up," he wrote in another tweet. But sure, go with "the Orthodox Jew who has never catcalled a woman in his life is ACKSHUALLY a sexist catcaller for asking for a discussion or debate." I’m sure your media sycophants will eat it up. In one CNN interview alone this week, Ocasio-Cortez bungled questions about House Minority Leader Nancy Pelosi (D., Calif.) and how to pay for her proposed "Medicare for all" program. This entry was posted in Politics and tagged Alexandria Ocasio-Cortez, Ben Shapiro. Bookmark the permalink.